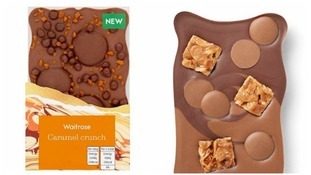 Waitrose has been accused of copying chocolate bars sold by high-end confectioner Hotel Chocolat. The supermarket giant’s new range of “Luxury Chocolate Bars” has come under fire for their striking resemblance to the curvy slabs sold at Hotel Chocolat. Angus Thirwell, co-founder of the premium chocolatier, hit out at the similarity on Twitter. He said his brand’s distinctive wavy-edged design had been registered with the EU Intellectual Property Office. Mr Thirwell told The Grocer magazine that he had written to Waitrose “asking them to do the right thing”. He added: “I designed it and it’s what built the Hotel Chocolat brand. “All over social media people are saying ‘I didn’t think Hotel Chocolat made bars for anyone else but they’re making these’. Waitrose told The Grocer it takes the intellectual property rights of other businesses “extremely seriously” and was looking into the points raised by Mr Thirlwell.